Are you interested in adding the best adjustable weight bench to your home gym but don’t know where to start? Do you have some strength training goals you want to achieve? Perhaps you are trying to build strength for a sport. Maybe you just want to improve your overall health and fitness. A good adjustable weight bench may be a handy tool to reach your health and fitness goal. Picking a weight bench might seem like an easy task at first. If you’ve started to look at benches, though, you might have realized that there are far more options than just brand and which one offers the best cushioning for your glutes and back. For one thing, there are a few styles of workout benches to choose from, each offering a different set of workout options that you may or may not want or need. Plus you should consider the bench’s stability, weight limits, portability, comfort, and ease of storage. Why Choose an Adjustable Weight Bench? While there are multiple types of weight benches that you can purchase for your home use, chances are an adjustable weight will work the best for the average user. In theory you could buy multiple types of fixed benches but most people don’t have the space or budget to create that extensive of a home gym. Plus, an adjustable weight bench combines all the perks and position of the flat, incline, and decline benches you could buy. 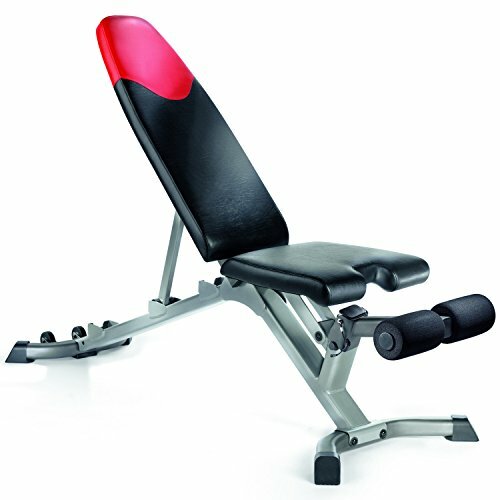 What are the Different Settings on Adjustable Workout Benches? The flat bench setting offers a padded, sturdy surface to perform a variety of workouts. The flat setting can be used to target all of your major muscle groups using both weights and gravity. For beginners or those not looking to target specific groups exclusively, the flat bench setting is a great beginner option. Incline settings offer angles ranging from 15 to 60 degree. The angle used changes the exact muscle groups that are targeted or ignored. Adjustable benches give you the ability to make small changes that can have major impacts on your exercises. The decline setting offers a means to get an effective, challenging exercise for your upper body and core. Like the incline settings, the decline setting targets specific muscle groups and can make the workout more challenging than using a flat option. Each of these types may have add on’s either included in the normal frame or as additional extras you can purchase separately. Typical add-ons are weight holders, leg braces, and stabilizers. What Exercises can I do on the Adjustable Weight Bench in Each Setting? Chest and triceps – If your adjustable bench comes equipped with a barbell holder, you can easily bench press when laying flat, which works your triceps and pectoral (chest) muscles. And, depending on factors such as grip and weight, can be manipulated while in the same flat position. Please use caution though if bench pressing and have a partner to spot you in case your arms give out. (2)Don’t have a barbell or partner? You can still lay flat on your back with free weights and workout your chest muscles. With a weight in each hand, make a bear hug shape with your arms and from slightly below your back, press the weights together as though you are giving a bear a hug. Core – You can do a series of core and abdominal exercises in the flat bench. This option is a good option for those that are more of a beginner or an intermediate user to do crunches, situps, and other abdominal exercises. Biceps – Just as sitting can help reduce excess movement that makes curls easier, so can sitting with your back flat against a bench in a slightly upright position. Additionally, the change in position will result in a change in how the muscles work and therefore different results. Shoulders – When your bench is set at an incline, there are a number of different shoulder targeting exercises you can choose from. You can do everything from seated shoulder presses at an angle to various fly options. Core – If you are a more advanced user, you can really challenge your core by doing crunches and sit ups at an incline. The steeper angle will really challenge your abdominals, by giving them greater range of motion to force them to work harder. Chest – In a decline position, benchpressing or free weight exercises can target a slightly different portion of your chest muscles – targeting the lower pecs. This is not necessarily better than a flat bench press, but if you are not used to it, it may feel more strenuous until your body gets used to the position. Triceps – From a declined position, you can do tricep extensions. The added distance of the full range of motion adds extra difficulty to the move that targets your tricep muscles. These are all just a few of the potential exercises you can do using the various workout bench positions. Keep in mind, a good quality, adjustable bench may well be worth the price if you want to have a full range of benefits from the various bench settings. Be sure to use caution and consult your doctor before you begin any new exercise routines. What other things should you consider before buying an adjustable weight bench? Some benches are built smaller by design. Though this may make it more appealing for small spaces and smaller users, if you are very tall or large, a smaller frame might not be the best option for you. Also, though not a firm rule, smaller benches may have lower total weight limits. Does the bench you want offer additional add-ons you can get later or that are a part of the package? You may not need or want them at first, but as you grow and change your workout routines, having to get an add-on is usually an easier option than replacing the whole bench because it offers no add on capabilities. Some benches are designed to fold up and store in small spaces. Others can’t fold. Neither option is necessarily better than the other, it comes down to the space you have for the bench when you are not using it. Though 300 pound weight limits might seem like a lot, when you factor in your own body weight, it could really hamper how much weight you can build up to before needing to upgrade your workout bench to accommodate your increasing weight needs. Comfort can be a big selling point of a bench. You are going to be actively and inactively pressing into the bench, so a cushioned, but firm, surface and one that gets good comfort ratings is desirable. More expensive does not necessarily make the bench better. It may be slightly bigger with more options, but sometimes an affordable bench that helps you get started and can grow with you is as valuable as a more expensive one. This may not register high on your thought process when considering a bench, but how easy it is to move around is important for both getting it to where you want it to be and moving it if you want it in a different place later. Look for benches that have wheels, are lightweight, or both. 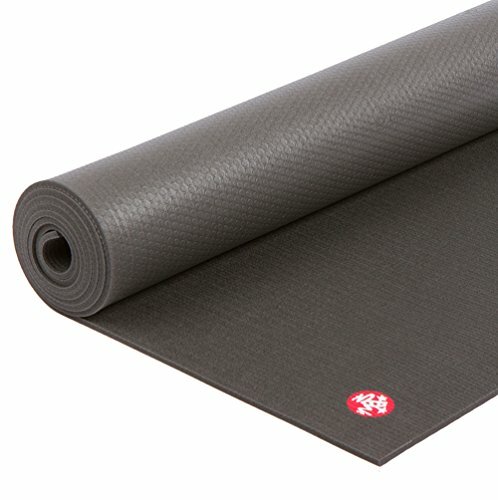 What are some of the best adjustable workout benches available for home use? There are a ton of options available that range from basic models to high-end models with lots of bells and whistles. And though it can be tough to choose the best, here are few top picks. These picks offer a bit of range in what they have to offer so you can choose the model best suited for your needs. Possibly one of the best benches available for at home use, the XM-7472 offers a variety of positions and add ons that give it an edge above some of its competition. The solid steel frame holds up to 1500 lbs of weight. It’s wide-base provides excellent stability, in any one of the seven possible positions, making this the only weight bench you would need. Multiple Positions: The 7-position ladder adjustments offer you a range of options from full decline to military press position. The adjustments make it possible to do a variety of upper body workouts without needing separate benches for different styles. Seat Positions: In addition to the 7 adjustable height positions, the seat has 3 positions to choose from as well. It’s well designed, cushioned seat offers practicality and comfort when completing workouts. Leg Hold Down Bar: The XM-7472 also offers a removable, 4-position T-Bar Leg Hold Down Attachment for use in decline positions. This helps make it suitable for both arm and abdominal workouts. Ideal For Upper Body Workouts: The multiple positions and decline bar make this an excellent bench for upper body development. Every muscle from your core to your shoulders and arms can get an effective workout when using this bench. Good Construction: The XM-7472 has a durable and wide, stable frame. Its cushioning around body contact points is superb. The finish is scratch resistant and will hold up to rough wear and tear. And, the bench comes with built in wheels that make it easy to move, while still offering bolted on skid resistant feet. 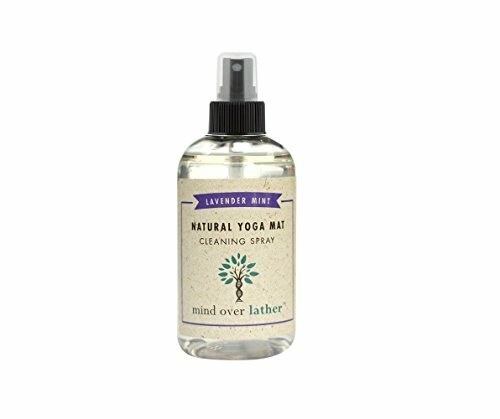 Smooth Feet: The feet of the bench are smooth rubber and may slip on a non carpeted surfaces. Assembly: Assembly may not be as easy as other benches. The instructions say 2 people are required and some users report doing additional work to make the bench work for the. The XM-7472 bench can be enhanced with two optional attachments. Preacher Curl Attachment helps stabilize and concentrate your bicep muscles during your workout. Leg Extension Leg Curl Attachment adds more options to your leg routines. These combined attachments help make the XM-7472 an excellent compound workout machine. 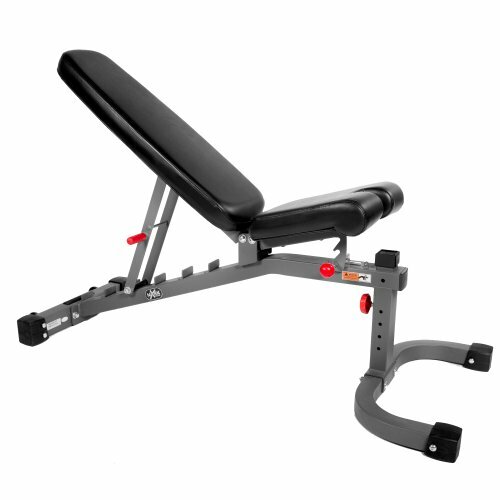 The Bowflex Selecttech 3.1 Adjustable Bench offers reliability and a solid base bench for a reasonable price. Bowflex is a well-known and respected fitness brand that offers options from workout stations to workout benches. They have a variety of bench options available, but the Selecttech 3.1 is one of the best for the price. Small Dimensions: The Selecttech 3.1 Adjustable Bench measures at 56” by 26” by 20”. This makes it ideal for smaller spaces. But bear in mind, if you are a taller person, you might not be fully supported in the head. Excellent Construction: The commercial grade steel construction makes the Bowflex 3.1 strong enough to endure a lot of use. Additionally, it is easy to wipe down, and the wheels in the back make it easy to move around. Four Positions: The Bowflex 3.1 has up to four positions to choose from: 90, 45, 0, and -10 degrees. The shifting between is easy to use and makes transitions between sets smooth, and targeting different muscle groups easy. Comfortable Seat: The seat does not move positions. However, the cushioning makes it comfortable for long workouts. Storage: The Bowflex 3.1 does not fold up. This may make it harder to store if you need to. Excellent Warranty: The Bowflex offers a 15 year replacement warranty on the frame and a 1 year warranty on the upholstery. Weight Capacity: The Bowflex 3.1 can support up to 300lbs of weight. If you are looking for more, you may need to consider a different bench. A great bench that offers a variety of workout options, the Competitor Olympic Bench by Impex Fitness offers an adjustable bench that can work your upper body, core, and legs. It also comes equipped with a barbell holder and leg press attachments. Multiple Positions: The 5-position adjustments offer you a range of options to work out your entire upper body and midsection. This bench accommodates nicely for different styles. Leg Developer: As part of the package, you get a leg developer machine. This two position weight lifting assistor helps you target both your quadriceps and your hamstring muscle groups, depending on the angle you use. Ideal For Upper Body Workouts: The multiple positions make this an excellent bench for upper body development. You can literally target every muscle from your core to your shoulders and arms and chest. Durable Construction: Like many other benches on the market, the Competitor Olympic Bench is made out of 2.5-by-2.5-inch, heavy duty steel tubes as its frame. The bench itself accepts Olympic size weights plates and boosts a 600-pound capacity (user body weight plus barbells). Finally, it measures 45 by 50 by 67 inches (W x H x D) so it is compact enough to not take up the entire room. Barbell Holder: The Competitor Olympic Bench features an adjustable barbell holder that allows you to do bench press exercises with ease. Of course, it is always safest to do these types of workouts with a partner who can help catch the weight if you lose your strength or grip. Limited Padding: Though like all benches, the Competitor Olympic Bench offers some padding, it is not the most comfortable bench available. Limited Two Year Warranty: Having any warranty is good, however; make sure you read what is covered when considering this (and really any bench). But getting a warranty is never a bad thing. 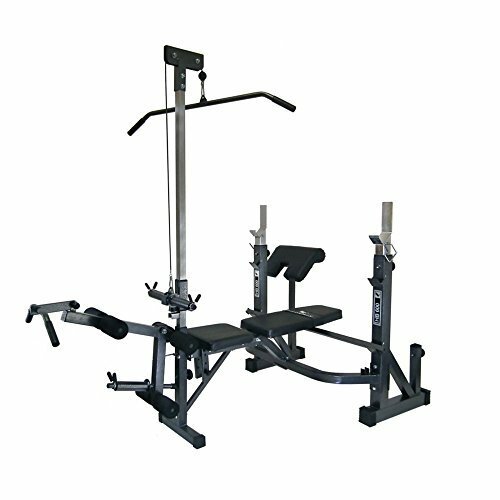 If you are looking for a bench with a lot of extras, the Phoenix 99226 Power Pro Olympic Bench may be exactly what you are looking for. This adjustable bench offers far more than just the standard adjustable bench with multiple positions. This behemoth of a bench is almost more of a workout station than bench, but it still qualifies as a bench option. Multiple Positions: Like the other adjustable benches, the Power Pro Olympic Bench offers a variety of positions in the incline position and an additional decline position. Preacher Curl Attachment: This bench comes equipped with a preacher curl attachment. This will allow you to not have to get an additional add on after the purchase as it comes with the normal bench. Leg Developer: As part of the package, you get a leg developer machine. The leg developer offers two positions so you can target both the front and back of your legs. 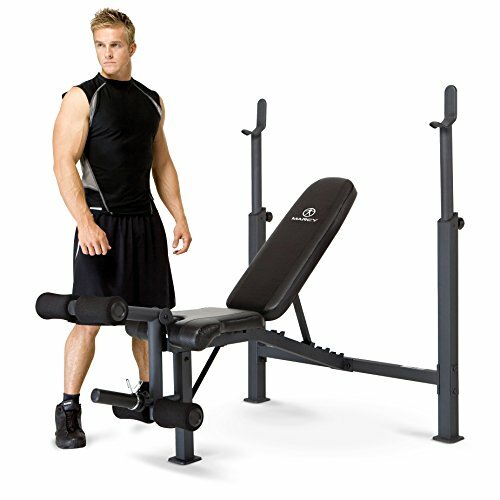 Ideal For Upper Body Workouts: The multiple positions make this an excellent bench for upper body development,. You can literally target every muscle from your core to your shoulders and arms and chest. Lat Tower: One of the nicer features this bench has to offer is the lat tower that allows you to easily do exercises that focus on muscle groups in your arms and back. Bench Press: With a built in rear facing squat bar, it is easy to do squats and bench press exercises. This will help both develop your chest and leg muscle groups. Assembly Time: It is estimated that assembly will take about two hours for this bench. Additional Cable Attachment Option: If you want to add more to your workouts, you can get a cable attachment which would help add variety and different resistance to your lat tower routines. This is an additional feature that is sold separately. There are a lot of factors to consider when purchasing your adjustable workout bench, but it comes down to personal choices in the end. One adjustable bench might offer you exactly what you want at the moment and grow with you as your workout needs change. Very likely, you will want a bench with flexibility and growth potential. You really can’t go wrong with an adjustable bench as it allows for a greater variety of workouts where you won’t have worry you are missing a muscle group and you can adjust your workouts quickly.